Jambo from 15,158ft/4,620m. Mama Kudra (Terri) reporting from Lava Tower Campsite. Today was a short day; we hiked for only 3 hours to get to our destination. We have been off the radar for a few days because we could not get a good enough signal. In that time we hiked from Big Tree Camp to the Shira campsite, traveled through the Shira Plateau on our way to Moir Camp and paid our respects to Scott Fischer at his memorial along the way. 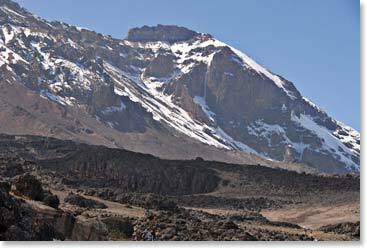 Tomorrow we head off to Karanga on the way to our destination – Uhuru Peak. 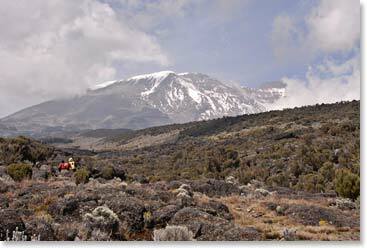 Stand by for further dispatches from the top of Africa from Mama Kudra, Bwana Mandega and Bwana Chuli (Terri, Tim and Rafael) and from our leaders Julius and Emanuel. Hello, Rafael here. All of us are really well. We are joined by Emanuel, our assistant guide. We traveled through the sharp rocks today from Moir Camp then across the alpine desert to the Lava Tower. We are spending the rest of the day here. 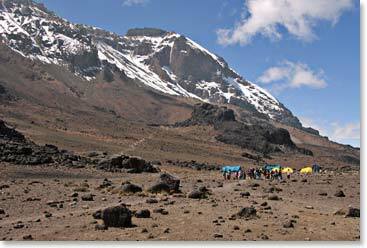 Tomorrow we will scale the Barranco Wall and cross the Karanga Valley. All the best to you folks at home.